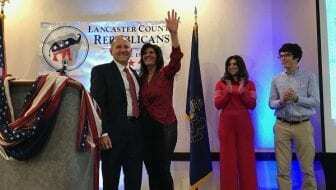 STATE IMPACT PENNSYLVANIA – Freshman GOP congressman Lloyd Smucker was reelected to a second term Tuesday night–defeating Democratic challenger Jess King in the 11th district. Smucker spent two terms in the state senate before his election to congress in 2016. He won in the former 16th district two years ago after longtime GOP congressman Joe Pitts retried. Smucker’s key message was that he kept his promises to constituents. He cited the nation’s robust economic picture, the Republican tax overhaul, and regulatory rollbacks. He touted his experience running his family’s drywall business, while painting King as a radical liberal, who would raise taxes. King took leave of her job as executive director of the Lancaster city nonprofit ASSETS to run for office and began her campaign before Pennsylvania’s congressional maps were redrawn, making the seat more favorable to the GOP.